If you could wave a magic wand over your team, what would you change? An extra hour in the day? How about shooting for the right goal and working as one team to get there? A poll of 23,000 employees carried out by Harris Interactive suggests most organisations in the western world find true teamwork to be all too elusive. To bring their findings home, let’s imagine your organisation is a football team. According to the research, only four of your eleven players would know which goal was theirs, only a couple would care, only two would know what position they play and all but two would in some way be competing against their team members rather than the opposition. Teams are only as strong as the relationships within them, and the direction they are facing. Patrick Lencioni, in his excellent book “The Five Dysfunctions of a Team”, reveals the secret sauce that can transform your team. We’ve all come across teams where nothing seems to move forward. There is a lot of talking but not a lot of changing. Things are agreed but somehow never quite implemented. The truth is spoken to individuals within the team, but not when the team is together – and these ‘corridor conversations’ eat away at the team like a cancer. It’s exhausting, inefficient and ultimately destructive. Lencioni reveals the solution through the fictitious Kathryn Peterson, CEO of Decision Tech – as she faces the ultimate leadership crisis; uniting a team so dysfunctional it threatens to bring down the whole company. But your leadership team doesn’t have to be dysfunctional. Working through the five principles contained in the book will transform your team – turning bad teams, average teams and good teams into high-performance teams. Teams that deliver. Teams that transform organisations. Fast. 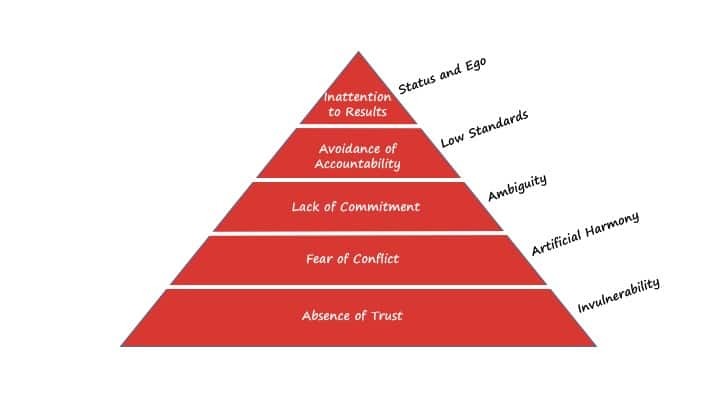 Let’s be clear: There is no magic wand – Lencioni reveals that genuine teamwork is elusive because teams need to navigate through five critical pitfalls, or dysfunctions, to become high-performance teams. The book will take you a couple of hours to read. But it’s not a magic wand. Applying it to your team takes effort – and the success that follows is worth every bead of sweat. Teams can only succeed when they are focused on team success, not separate agendas if they hold one another accountable if they commit to decisions made if they engage in passionate unfiltered debate – and, of course, if they trust each other. When people who don’t trust one another engage in passionate debate, they are trying to win the argument. They aren’t usually listening to the other person’s ideas and then reconsidering their point of view; they’re working out how to manipulate the conversation to get what they want. Or even worse, they are not arguing with the person face to face but venting about them in the corridor somewhere after the meeting is over. Leadership teams who understand and trust one another engage in passionate unfiltered debate, saying what needs to be said in the room, not afterwards, all in the spirit of finding the right answers and putting them into action. Leadership teams who engage in constructive conflict reach a level of commitment to decisions that surpasses all other teams. Leadership teams that build on this by holding one another accountable, not just for achieving their goals, but the way they achieve them turn commitment into performance. And finally, leadership teams who step out of their silos, recognising collective team goals are the key to organisational success, not their individual departmental goals are the ones who truly transform their organisations from mediocre to exceptional. Organisations that last. Organisations that deliver. Organisations that lead the way. Because the true measure of a team is whether it accomplishes whatever it set out to achieve. To deliver on an ongoing basis each dysfunction must be overcome. How? That’s exactly what the book is all about – and that’s exactly what I do. Read the book – it is quite simply the best book on leadership teams you will ever read. And when you are ready to put it into action then get in touch. Whatever you need to achieve as an organisation – I can help you build the kind of team that will make it a reality. From a phone call packed with valuable insights for making it happen, to expert support every step of the way. So, set off by ordering the book now. Start reading it as soon as it arrives. And remember – it only delivers results if you do something with it. 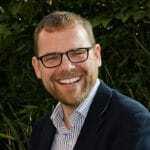 A sought after coach and change agent, Peter has spent many years in Organisational Development, focusing on developing high performance leadership teams, executive coaching, strategy and change. He builds relationships quickly and is as comfortable in the boardroom as he is at ‘grass roots’. Known for his integrity, energy and a real passion for making things happen, he has a uniquely direct yet supportive style that delivers. Peter is a qualified NLP master practitioner, a Chartered Fellow of the CIPD and a Chartered Engineer. Want to have a conversation with Peter? You can request a call back by simply filling out your details below.